Great how Everton can make you feel better out of nowhere, isn’t it? The sun shone on L4 as the Blues trounced Aston Villa, and now that Hurricane Gonzalo is causing havoc, who cares? We’re off to France. The French don’t react well to invasions so this one could get messy. Amidst a mad Premier League matchday – 40 goals, Sunderland being hilariously bad, Marouane Fellaini actually doing something boss for the first time in what seems like forever, and a game so typically Liverpool I don’t know why I didn’t put a tenner on a 95th minute own goal winner – Everton just cruised. After the drama of recent games we needed this. Sure, Aston Villa were shocking. When Tom Cleverley and Alan Hutton are your standout players, it’s a bad day all round, but we were excellent. Best of all for me was Tim Howard’s game. What did he do? Nothing. Maybe caught a ball once (always a bonus with Tim) and that’s about it. Perfect. That’s the great benefit of possession football – while we have the ball, they can’t do a thing. Sure, for the first fifteen minutes or so it was a waiting game, but when Phil Jagielka nodded home it all fell into place. Then of course we did that Everton thing where we allowed them right back into the game, right? Nope. The dominance continued. So, naturally just after half time a goal came from nowhere…but we scored it. So the third goal was a scrappy Villa strike out of nowhere, probably from a set piece? Nope. 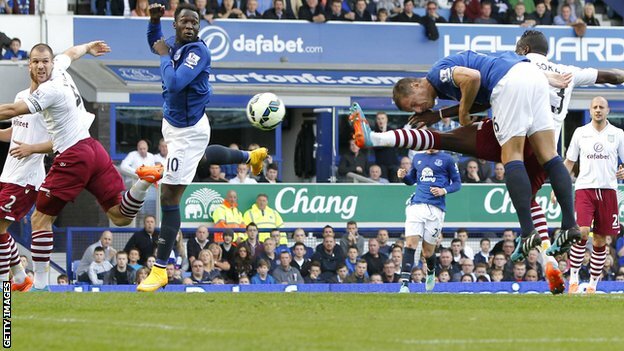 It was a third Everton goal from a cleverly taken free kick. And we scored from a corner. An actual corner kick. For the first time since March as well. This performance gave us another glimpse of that Everton we want to see every week. Who was boss? Where do we start? Phil Jagielka grabbed another goal. Sure, it wasn’t a thirty yard belter in the Kop End coupled with the “and what mate, do them all the time in the garden” looking celebration, but they can’t all be. Whisper it but Antolin Alcaraz was competent in defence. Confident on the ball, slightly sharper looking when defending rare Villa attacks, and one clean sheet secured. Where’s yours, Sylvain? Leighton Baines whips in the assists with both feet now, which is a scary new dimension the world’s premier left backs must not appreciate. Ashley Cole’s still better than Baines eh? Arjen Robben ground him into dust. In a bit Ashley. Seamus Coleman showed why we missed him in all manner of ways with a typical Coleman performance – untroubled at the back, because he was too busy bombing on and scoring another goal. When the full backs went up, they were covered by Gareth Barry and James McCarthy, who were both magnificent. That McCarthy slidey on Cleverley on a loop would be addictive viewing. 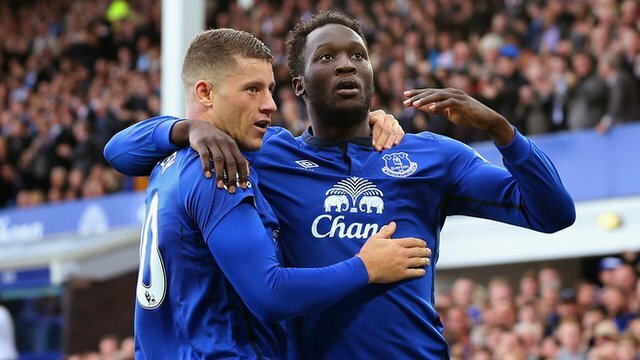 Romelu Lukaku scored, which always helps, no matter how tame it was. To be fair, he looked a fair bit more confident after that. Ross Barkley. How sound is Ross Barkley? He just brings excitement, doesn’t he? Like some floppy-haired set of spanners with autotune reducing their squawking fans to screaming messes, except Ross has actual natural talent, and we have a bit more control, thank you very much. Or so we tell ourselves. He’s not at 100% boss level yet but it was at least 80% boss on Saturday. A few buccaneering runs and an assist on his season debut makes for good reading. So…are the good times back? Can we stop peering from behind our fingers and step out into the light? Perhaps. As I said last week, upcoming fixtures look decent. Burnley, Swansea, Sunderland and West Ham aren’t exactly titans of the game, although West Ham deserve credit for a good start. If this really is the Everton juggernaut on the roll now they’ll have no chance anyway. But the Europa League’s also on the agenda. Really, with four points from two games, two more wins should wrap up progression from the group stage for us. So it could be over in about a fortnight. Like that time when we sent the Under 15 B team out against BATE Borisov, and made Hibbert, Osman and Yakubu play too because it was “banter” or something. We’re not through yet, so let’s get on the next lot. Lille Olympique Sporting Club. Ah, France. Never has one country believed in its own hype as the French. Everyone knows that Cannes is a poor man’s New Brighton, anyway. 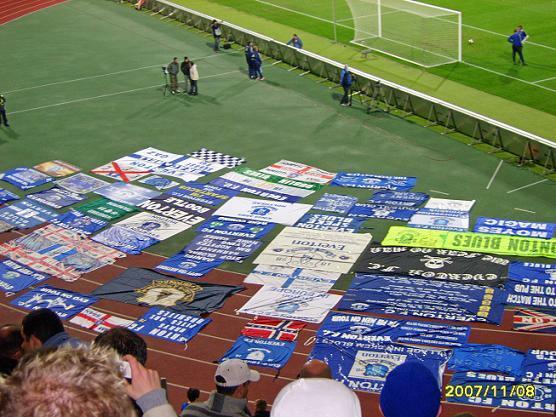 Those scruffy oiks in Lille want a hiding, so we Evertonians are going to give it to them. Not off the pitch, of course. We don’t do that. So reports that some scruffs have started on Evertonians who according to all sources had been peaceful and respectful all day is a disgrace. Your team’s getting smashed for that, Jean-Claude, and your city centre might take a beating too. And we’re having all your beers and lemo. They’re bricking themselves, this French lot. Why? Because we’ve got droves on the way down. Estimates are about 34,000,000 Evertonians crammed into the city centre tomorrow night, or 15,000 or something. Lille are well known for having a ground they struggle to sell out – they failed to in their Champions League tie against Porto – but Everton are in town, so those tickets are gone. This could be one epic away day alright. So don’t let the side down, alright Everton? Nürnberg away. Those were the days. Who are this lot then? In August 1944, to prove that the French were doing all they could to help the Allies end the Second World War once and for all, the people of Lille strove to make a difference. They ended up merging two local teams to make Lille OSC and left us to do the rest. Sound, cheers Lille. 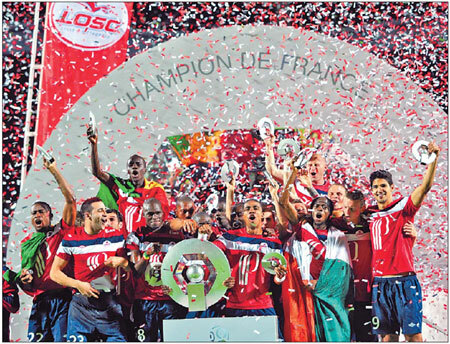 The 21st Century has brought them all sorts of change, which culminated in 2011 with a Ligue Un and Coupe de France double, which is no mean feat if you’re not PSG (or Lyon back in those ancient times of 2002-2008). Like Wolfsburg, however, the current squad are a shadow of the trophy-winning sides of even a couple of years ago. The likes of Hazard and Gervinho are long gone. Ex-boss Rudi Garcia is now at Roma watching Ashley Cole get his legs taken off by Robben so Rene Girard is in the hotseat. Not a bad side he’s got either. Vincent Enyeama may have spent the World Cup watching Lionel Messi shots fly in and shrugging, but he’s an excellent goalkeeper. Corchia and Kjaer stand out in a defence that keeps a lot of clean sheets, while there are a few decent players knocking about in midfield and up front. Marvin Martin, Nolan Roux, Ronny Rodelin, club captain Rio Mavuba…won’t pretend I know all that much about the rest, so one I haven’t named will score, nailed on. Hang on. What’s this? Aha. Divock Origi. No Liverpool fan knew him before June, but now he’s the next – uh, where does he play again? Up front? The next Thierry Henry then. A swift Gareth Barry leveler should sort him out. From what I know Origi has scored three goals so far but Lille as a whole don’t score a whole bundle. Clean sheets but unable to bang the goals in? The anti-Everton, this lot. Unclean. Lille started excellently but a thrashing by Lyon was followed by defeat at home to Guingamp, so they’re on the rocks right now. So really we need Everton to stick the knife in here. Basically, we have to suppress our most Everton instincts of all, and be ruthless. Again. Shocking news from the off though, as Steven Naismith stays at home with a scalp injury or something. With Barkley back it doesn’t seem so terrible to let him have a day off. Let’s face it; it must be pretty tiring being magic all day, every day. Ask James McCarthy. So Tim Howard is in goal, and this time he might actually have to do something. May as well have the same defence, seeing as Coleman, Jagielka, Alcaraz and Baines looked sound together, although this might be a chance to let Distin come in. Barry and McCarthy are doing fine, leave them. Lille are a bigger threat than Burnley really aren’t they. From here a few Europa League “specialists” (e.g. ones not normally trusted to start a Premier League game) come on. So that’s Atsu and Eto’o in, surely. No Osman for this one (stop celebrating. Show some respect). McGeady will probably get 90 minutes under his belt, and Barkley may well make his European bow too. If not Pienaar can play and we’ll just have a whole mess of confusion behind Eto’o. Sound. Basically right now it’d be hard to back any opponent of ours to keep a clean sheet, which is a good feeling. That’s what we’ve always wanted. A corner of France is swarming with Evertonians, fresh out of a convincing win and in sight of another. It’s another magic away day to take in. Let’s enjoy it. Vive L’Everton! *In no way do we condone the imbibement of alcohol or hard drugs – unless you really wanna.